The stories of our lives link us together. Sharing museum exhibits that tell important stories with more people in more places. This is the mission of the NEH on the Road exhibits. 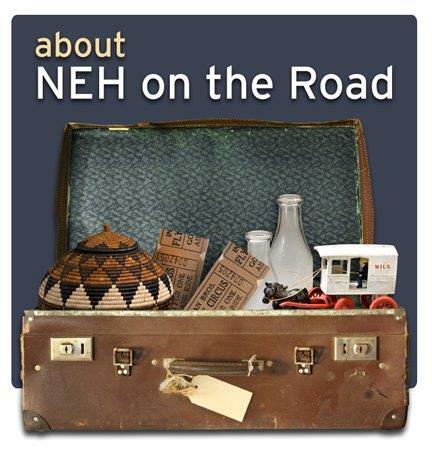 Designed for smaller venues, each NEH on the Road exhibition requires only 2,000 square feet of space – bringing the same high-quality information and objects that the National Endowment for the Humanities presents in its large-scale exhibitions to every corner of the country. Utilizing a combination of artifacts, text, graphics, photograms, interactive content, and other educational programming, exhibits are available to small to mid-sized museum, library, school, and university hosts anywhere in the United States for seven weeks. The Mid-America Arts Alliance developed NEH on the Road in 2003 in response to the demand by smaller museums and communities for high-quality humanities programming that fit their spaces and budgets. For more information, and to host an exhibit, click here.